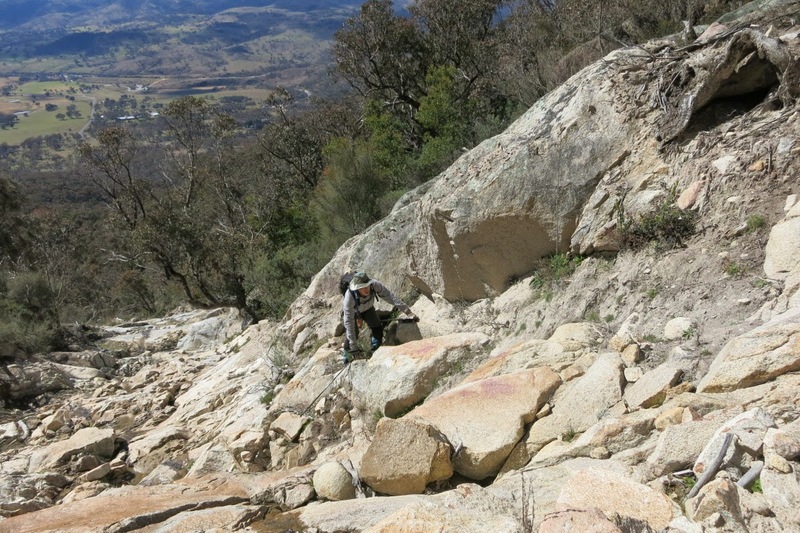 I climbed Mt Tennent 3 weeks ago via a well-maintained track that started near Namadgi Visitor Centre in ACT. 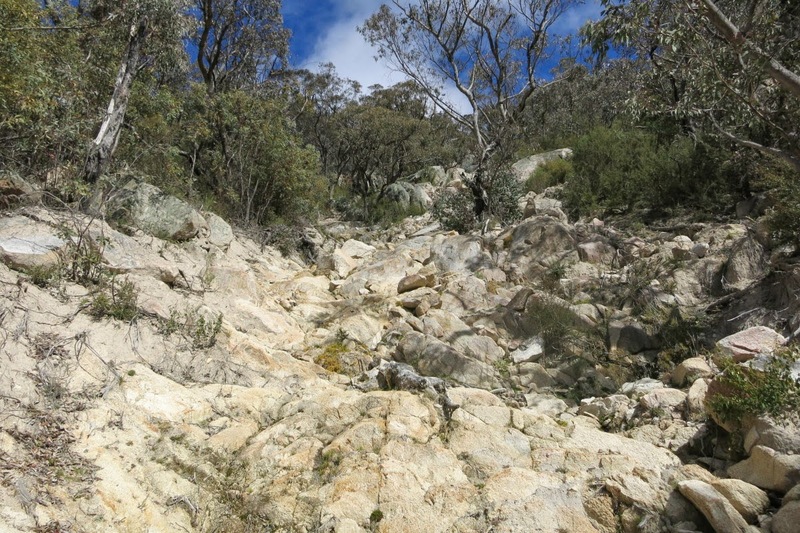 ( Refer to http://mntviews.blogspot.com.au/2014/08/mt-tennent-act-australia.html ) It was then that I became fascinated by The Scar that ran from the top of the mountain to the bottom. It was a mud slide that happened in March 2012. Hence decided to climb the mountain again, this time via The Scar. It turned out to be a very fascinating trip - not the usual run-of-the-mill walk ... plenty of out-of-the-ordinary climbing on all our fours ! 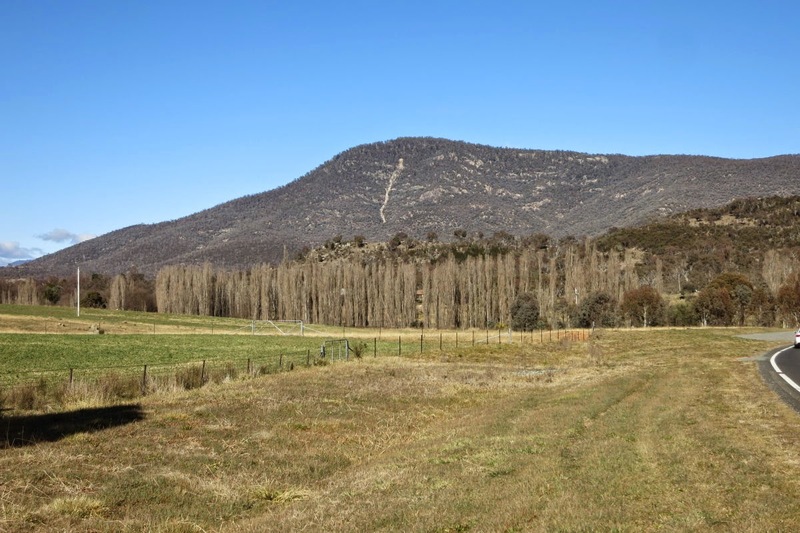 When you are near the Namadgi Visitor Centre, the first thing you notice is a towering mountain dominating over that part of the countryside. Well, that is Mt Tennent. But it is not a high mountain. Wikipedia says it is 1375 metres in elevation. Australian government topographic map gives 1384 meters. 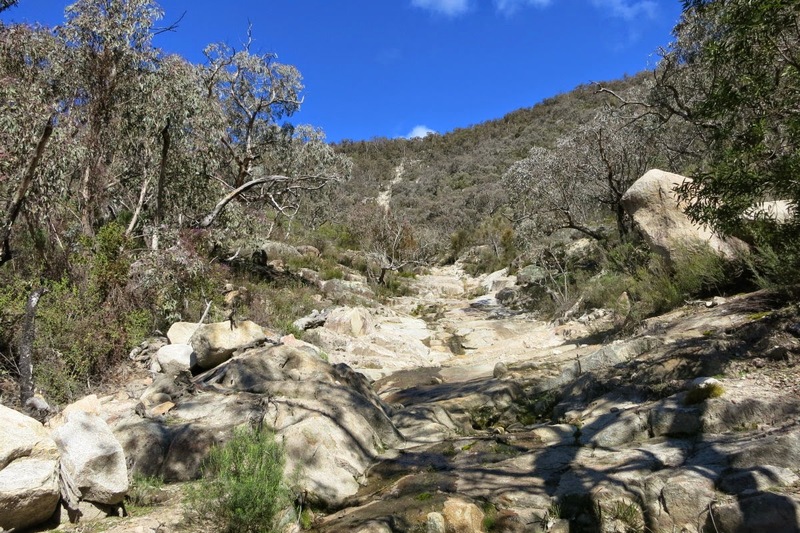 The walking track that starts near the Namadgi Visitor Centre is easy to walk on for hikers; and popular with the Canberrans. 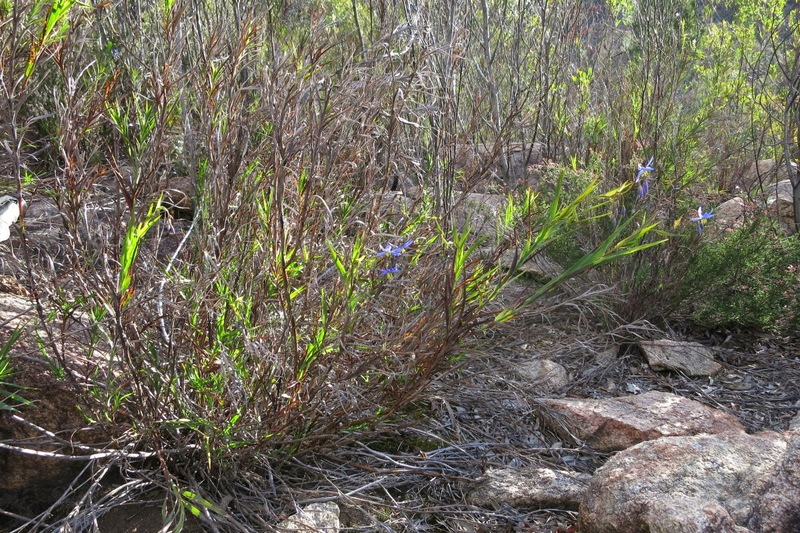 Many walk up the mountain as an exercise. On the day, however, no one climbs up the mountain via the mud slide. So we had the entire slope to ourselves ! 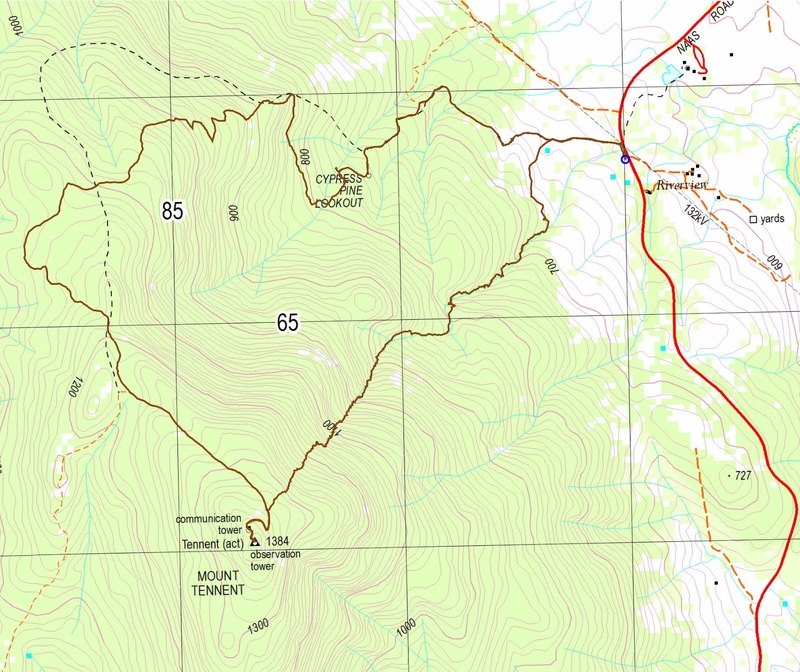 Below is a map of Mt Tennent. 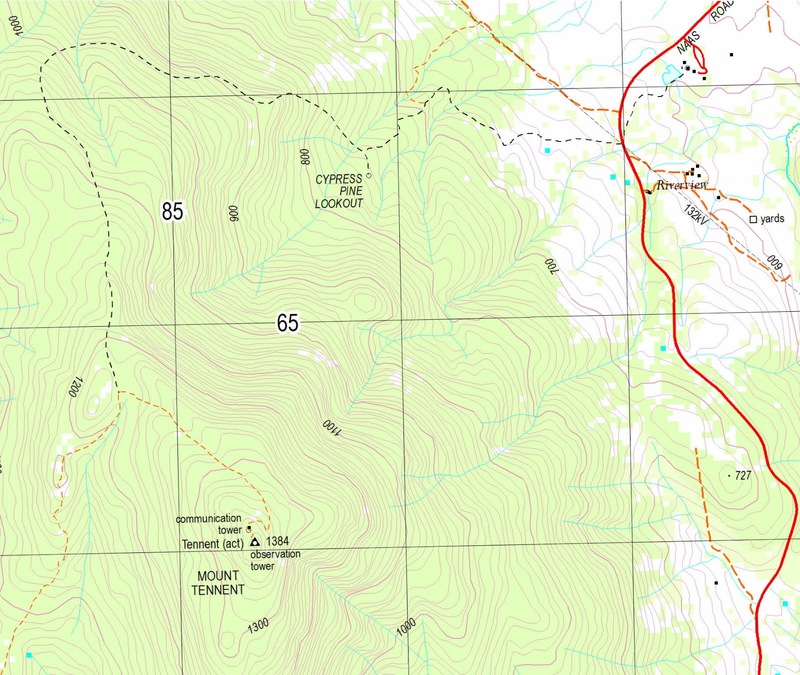 - Namadgi Visitor Centre is near top right hand corner of the map, by the side of Naas Road. - But note that the black dash line meant to represent an existing walking track, is incorrectly drawn ... see the next map. 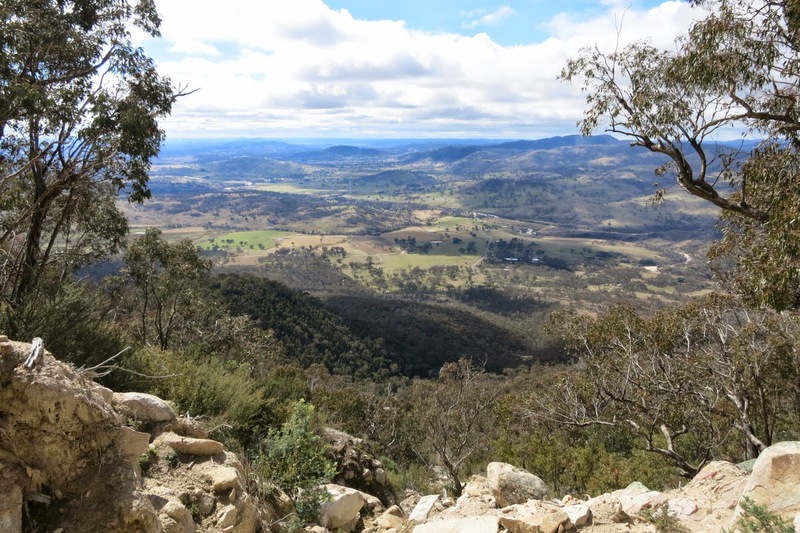 You can (and many do) park the car at Namadgi Visitor Centre and start walking from there. We are a bit lazy, park the car by the side of Naas Road, about 500 meters south west of the Visitor Centre (the small blue circle in the below map). 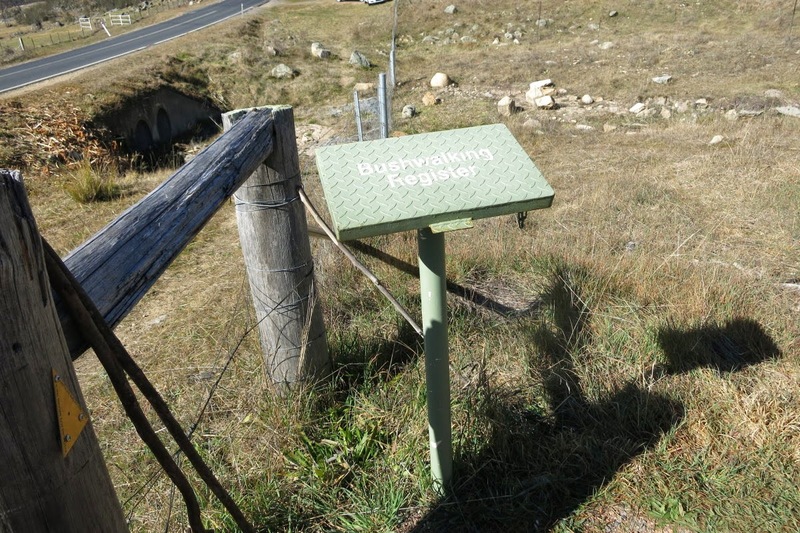 If you see a green bushwalking register box on top of a post by the fence with a register book inside (photo #4) ... well, that is where the trail head is. In the below map, our route is in brown. • We climb up on the mud slide first - in the map, it is the more or less direct route from where we park our car (small blue circle) to the summit. 16:26 10.0km Back at car. 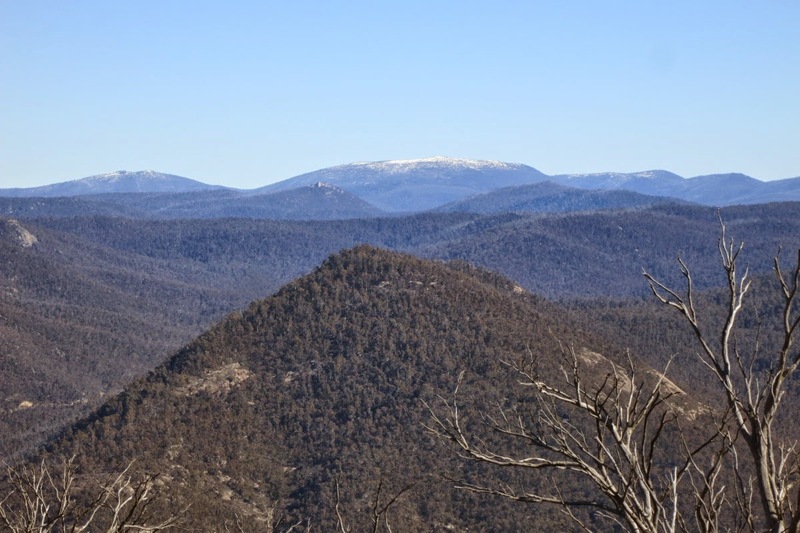 1) Mt Tennent, in ACT Namadgi National Park, towers over the ACT Tuggeranong area. We'll soon be climbing up the long thin scar (the mud slide running down the middle of the mountain). 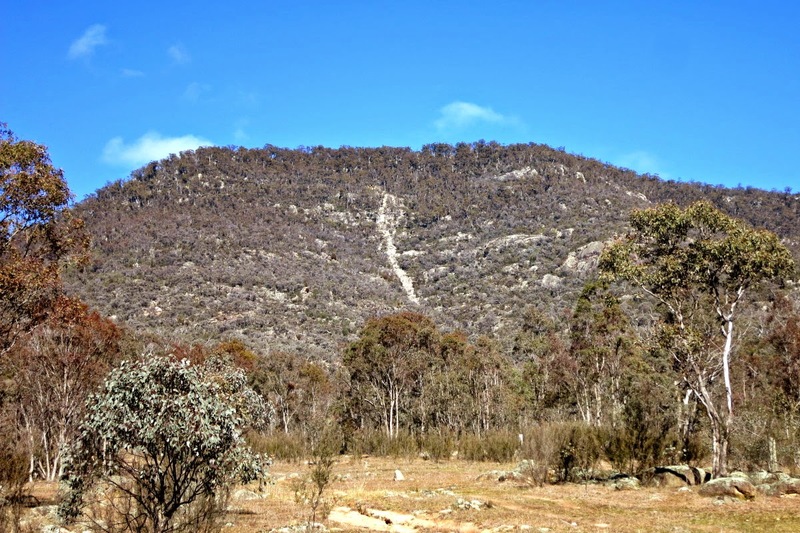 2) Mt Tennent and its long thin scar, the mud slide, near the trail head. The gate here belongs to a private property. The trail head is a few more steps on the right of this photo. 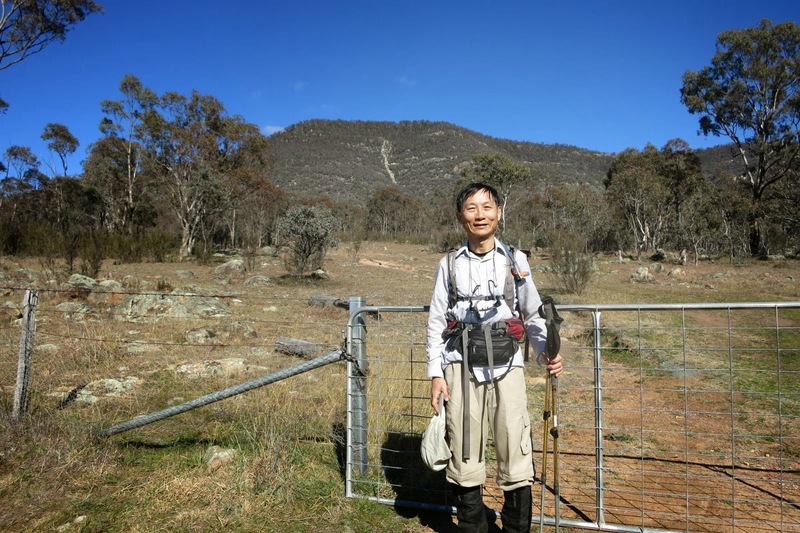 4) We park our car by the side of Naas Road near where the trail head is - which is about 300 to 400 meters south west of the Namadgi Visitor Centre. 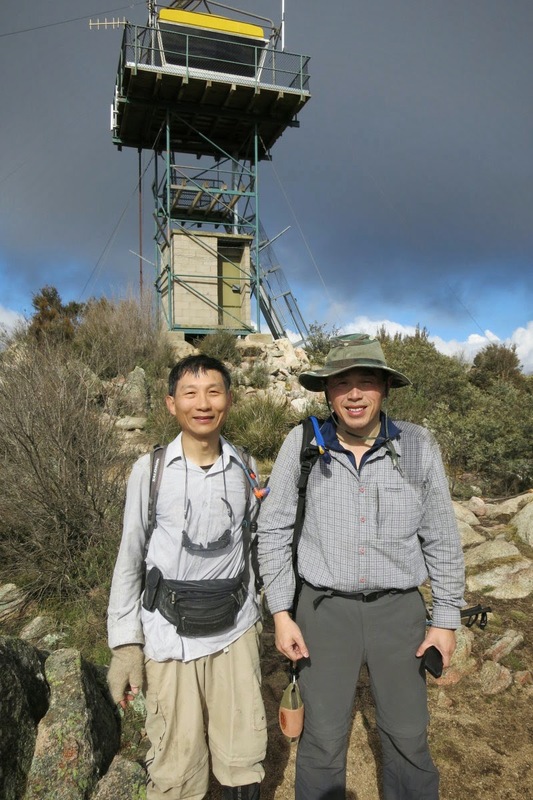 To locate the trail head, look for this green bushwalking register box on top of a post by the fence with a register book inside. 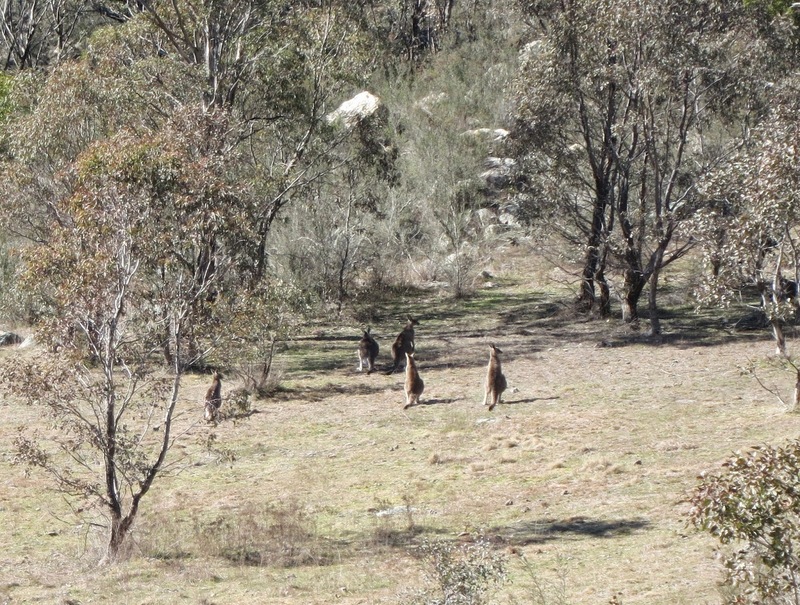 5) Plenty of kangaroos near the trail head. 6) Climbing up the mud slide - it is straight up all the way. 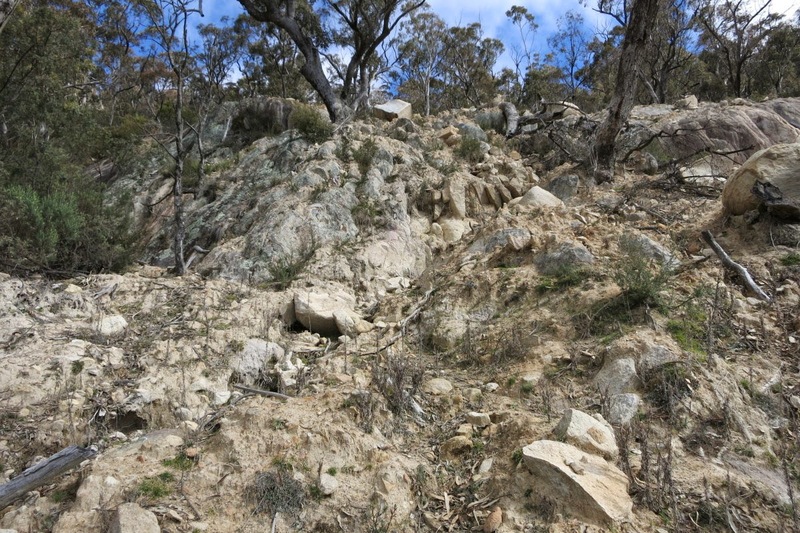 10) Plenty of hairy steep climbs. The loose sands make the climb slippery and dangerous. 11) There are a few of these hairy cliffs to scale over - definitely not for the faint hearted. If you are scared of height, don't climb Mt Tennent via the mud slide. 12) This large boulder is like a beacon on the mud side. It looms large on the edge of a small cliff. We can see it from a fair way down the mountain. Strange how it had tumbled down the slope and just stood on its end like this. 13) An advantage of climbing on the mud slide is that you get a marvellous view of the valley below right through the climb. The same cannot be said about the normal trail. 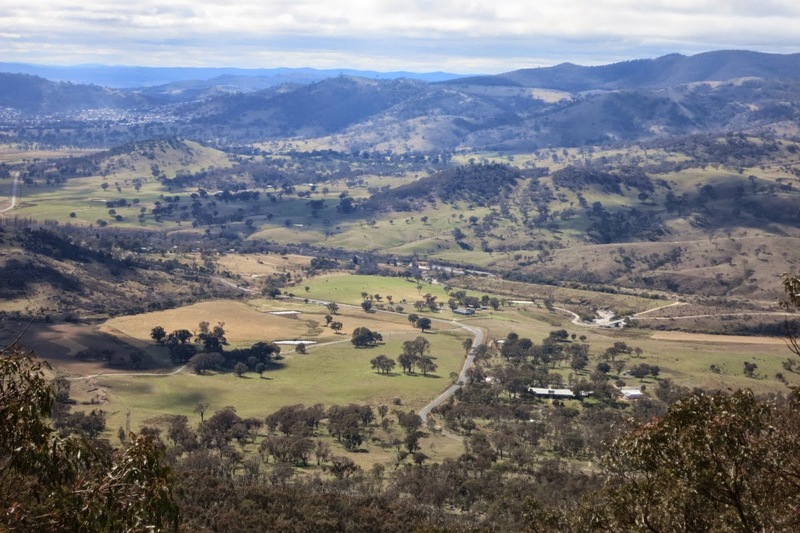 14) Zooming down on the valley - The Namadgi Visitor Centre is the nearest building to the camera. Usually hikers park their cars there, then walk to the trail head. 15) We reach the head of the mud slide. The tree line across the middle of the pic marks the point where it all happened back in March 2012. Strange thing is right here it is quite flat. So, why did the mud slide started here? 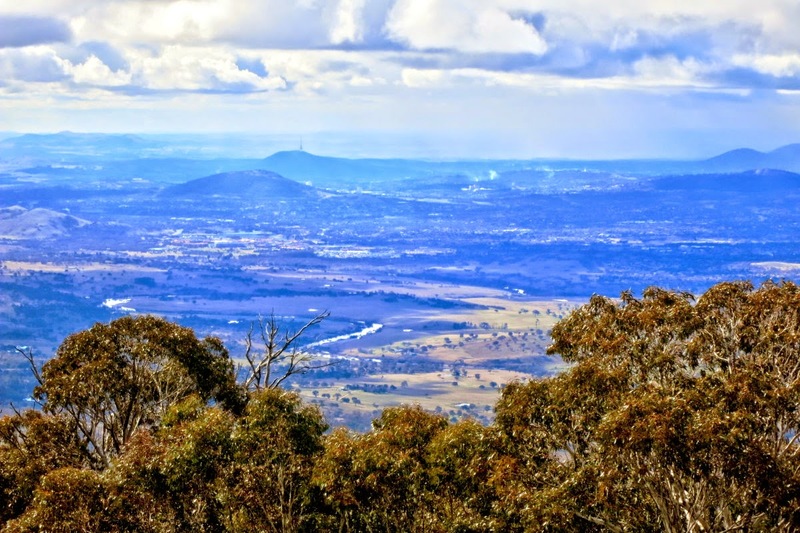 17) From the summit, there is a nice view towards Canberra - you can see Black Mountain and the telecommunication tower on top of it. 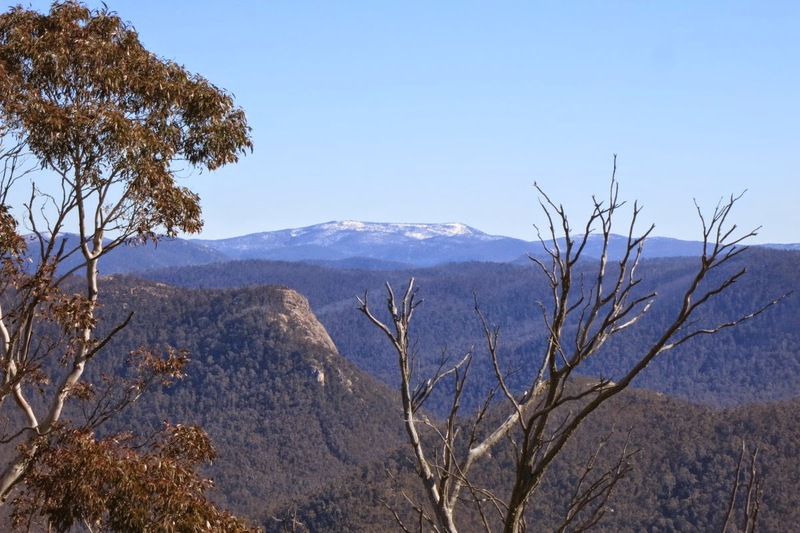 18) At the summit, towards the west, there is a panoramic view of Brindabella Range, Bimberi Range and Scabby Range. 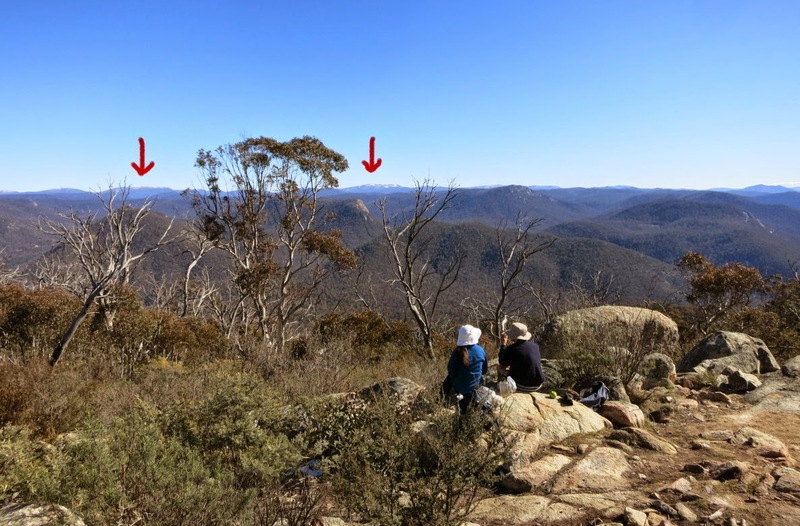 The left arrow points to Bimberi Peak, the highest mountain in ACT. 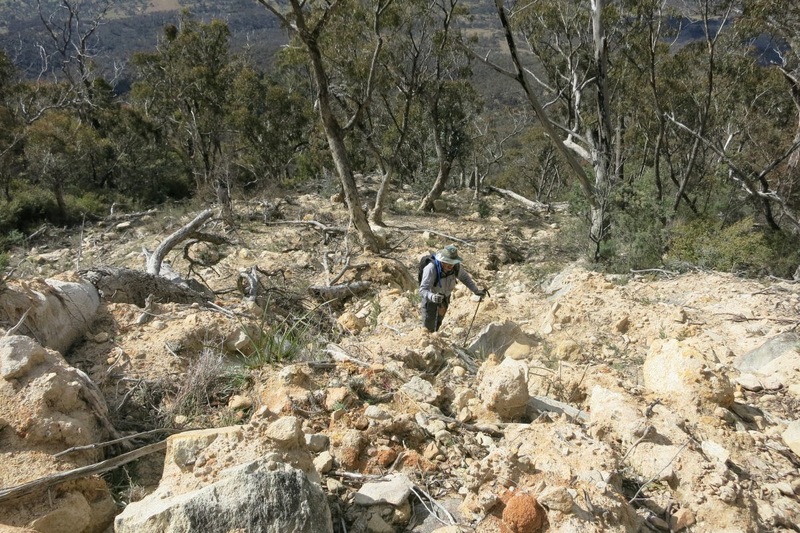 The right arrow points to Mt Gingera, 2nd highest in ACT. Glad to see these old friends as I've climbed both of them. 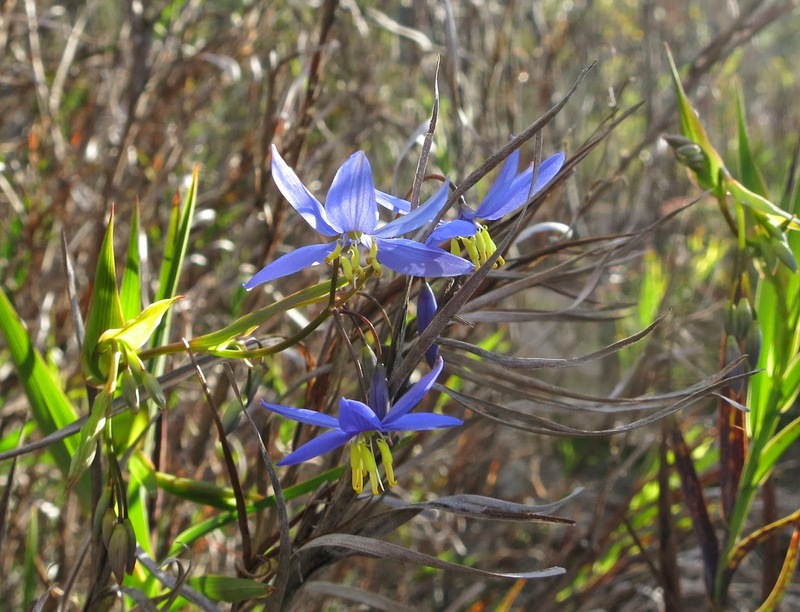 23) These tiny blue flowers with yellow stamens are called Nodding Blue Lily; scientific name is Stypandra glauca. 24) Close up view of Nodding Blue Lily ... they are a sheer delight to look at ! 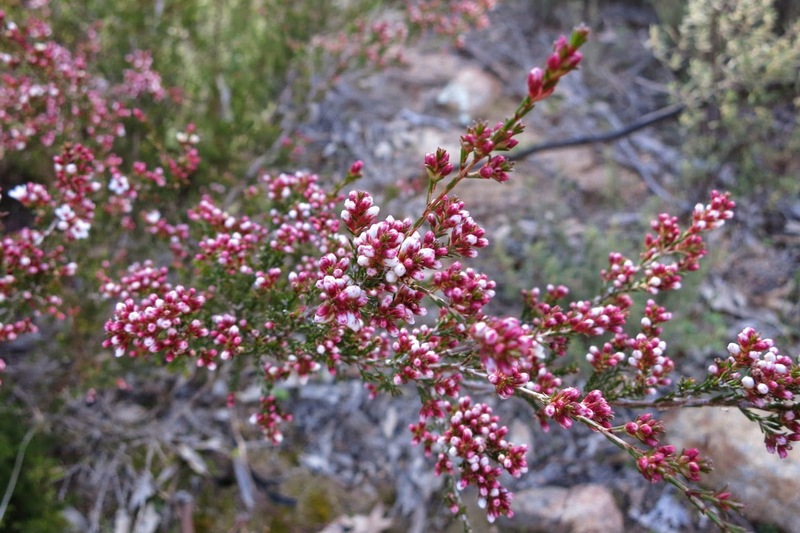 26) Closer look at the tiny red flowers. 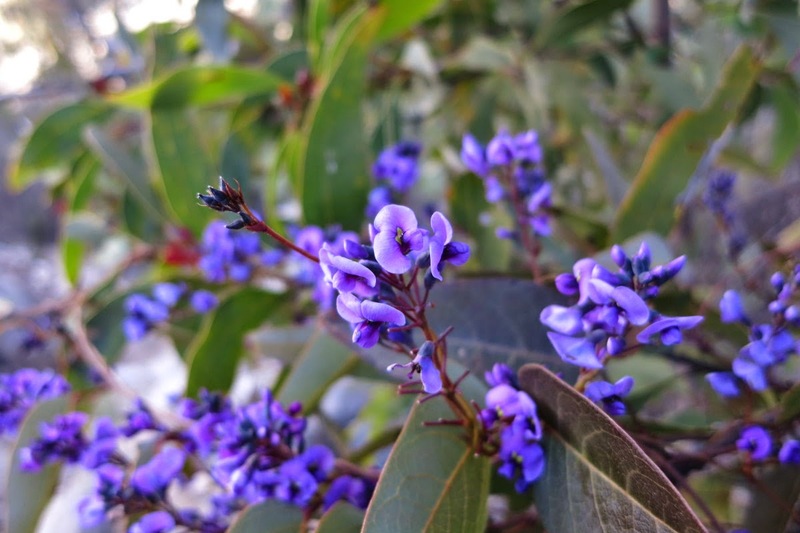 Does any one know the name of this flower? Thanks, Paul. I enjoyed reading about your two trips to Mt Tennent. 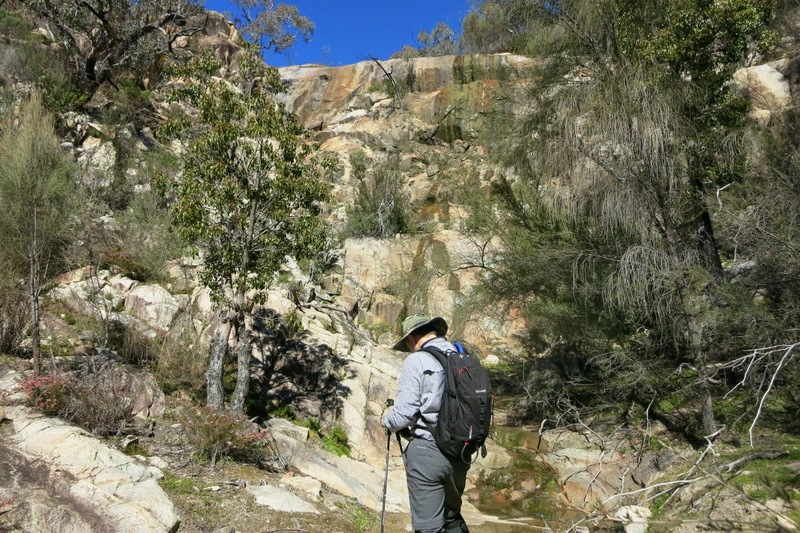 I'm leading a walk from Booroomba Rocks carpark via Bushfold Flats to the top and then back down the walking trail to Namadgi Visitors Centre. We're not being quite as adventurous as you but I'm tempted to try walking up the scar in the future. Do give the Scar a try. If you come across a cliff that you are afraid of climbing over, you can always exit the mud-slide, bushbash upward to by pass the cliff, then re-enter the mud slide at a higher point. Hi Ross. You said you're leading a walk? 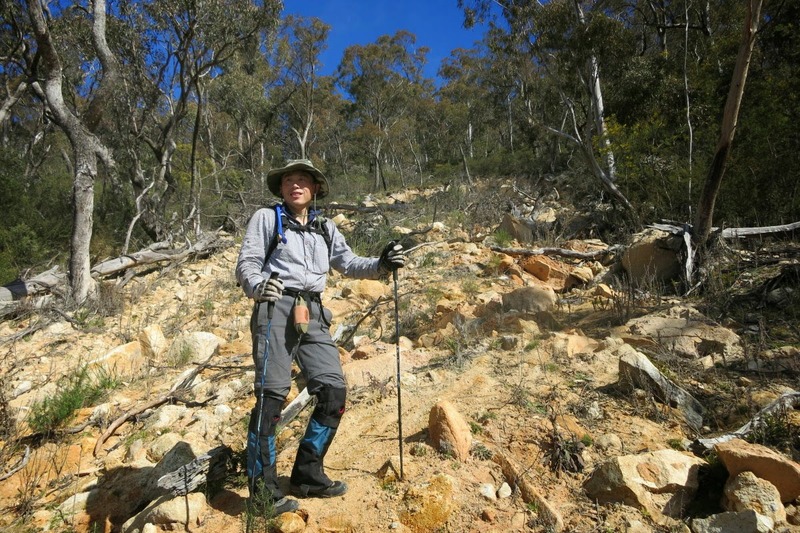 Are you with one of the bushwalking clubs here in Canberra? I am. Perhaps we've met? BBC and CBC? Great description and pix Paul. I've wanted to tackle this for a while. Have done the usual hike up the trail several times. 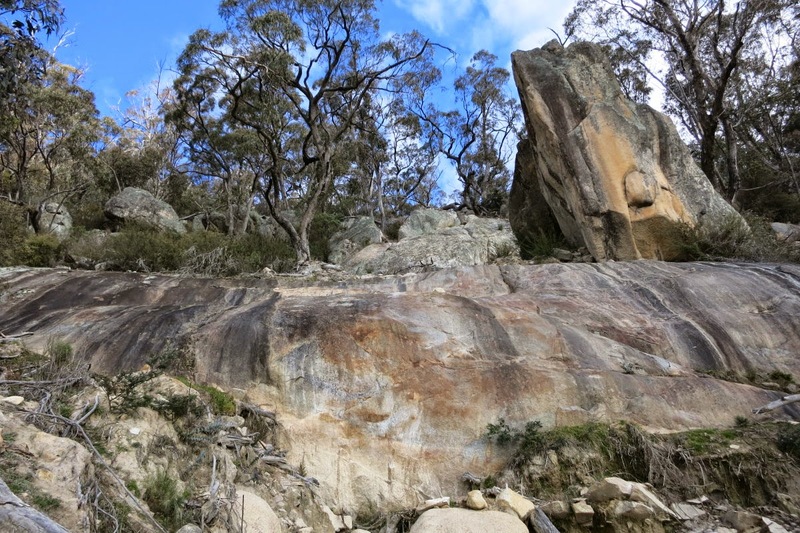 Have you ever done the walk to Gorilla Rock, near Booroomba Rocks? It's an amazing walk. 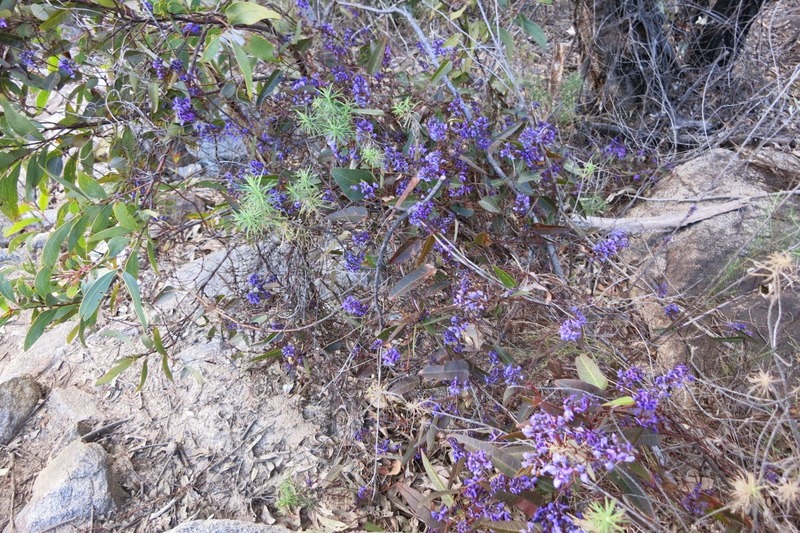 You start on the AAWT from the Honeysuckle Creek Car Park, then head NW into the scrub after about 1 km of walking. 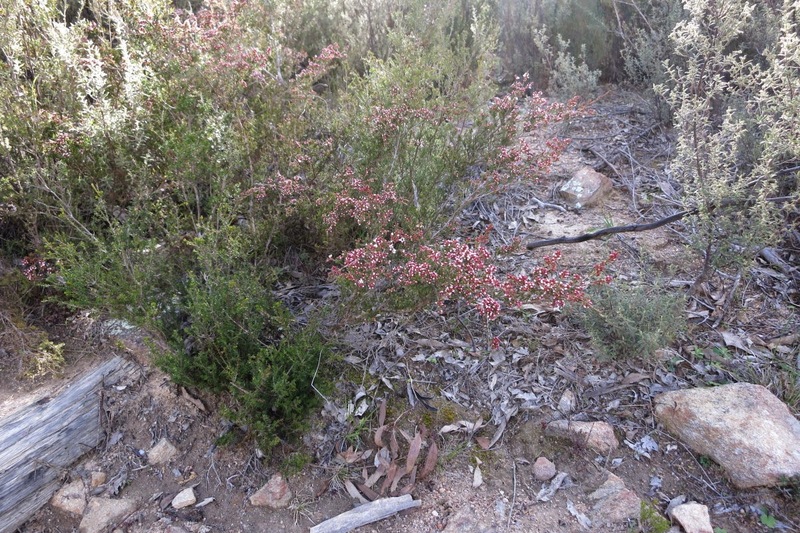 You have to tackle lots of thick scrub and do lots of work with the compass to find the best route but worth it. Is this just a day hike? Also how long in total did it take going there and back (return)? Jemimah, It is a day hike ... Please read the "Timeline" section, it has all the details that you need. Added this to my To Do list, after walking up the "normal" walking route. Looks like an interesting alternative way up!